In a recent blog post I summarised data for 2009-11 on financial flows with potential development benefits from Papua New Guinea’s four largest mining and petroleum operations. I estimated the size of the main categories of financial flows. In descending order they are: taxes, royalties and dividends to the national government, procurement from PNG-based business, payments to development authorities and trusts, compensation and royalties to landowners and communities, expenditure on company community development programs, and dividends and royalties to sub-national levels of government. This post considers the information available on the second last category — company community development programs — and finishes with some overall conclusions about the mining and petroleum sector’s contribution to development in PNG. These draw on my presentation at the Development Policy Centre’s recent PNG Update (podcast available here). Estimated total payments for community programs by four companies (Lihir Gold Limited, Oil Search Limited, Ok Tedi Mining Limited (OTML) and Porgera Joint Venture) amounted to PGK176 million per year from 2009-11. This sum is modest compared with the size of taxes and other payments to the national government (PGK1568 million). However, in the context of company payments to sub-national governments of PGK140 million, and the national government’s 2011 budget contribution of PGK210 million to all provinces for education, health, transport infrastructure, village courts, town and rural services, PGK176 million is a significant contribution to meeting development needs in PNG’s provinces and districts. A word about information sources. Three of the four companies publish annual sustainability and responsibility reports (Lihir and Porgera through the reports of their parent companies, Newcrest and Barrick); Ok Tedi and Porgera produce annual statistical summaries (‘Porgera Information Booklet’, ‘Ok Tedi Mining Historical Statistics’) that include community programs. In general, these reports outline the company’s commitment to supporting community development and provide descriptions of selected programs with supporting data and photographs of some facilities and beneficiaries. From company reports one can get a reasonable overview of the types of programs supported and a sense of the extent of their reach, for example, number of people accessing company-funded health facilities. However, the data is far from comprehensive. So, for example, it is not possible to accurately assess expenditure by sector. But the reporting is sufficiently detailed to rank the sectors. It seems clear that infrastructure, health and education are the largest components of corporate community programs. Infrastructure programs include building and maintaining roads, bridges, wharves and airstrips, schools, health facilities, community centres and women’s facilities, power supplies, and water supply and sewerage works. Support for health services includes extending to the community access to medical services provided for employees, as well as funding and providing logistical support for community health centres, health patrols, disease control and treatment, and medical or health emergencies. Education, including scholarships for school and university, and small business development and rural livelihoods are two other important areas of focus. The published information is generally inadequate for assessing the development contribution of these corporate community programs. We know that company programs are highly valued by those who access them, but we know much less about population outcomes or impacts. For example, what proportion of the local population is served by the infrastructure or services provided? Are there teachers, instruction materials and other supplies at the schools that have been upgraded? Are education, health and income indicators improving? It seems that few companies monitor and report publicly on this sort of information. It isn’t easy to do and it requires companies to make a significant investment in program monitoring and evaluation. One exception I found was Oil Search Limited’s 2011 sustainability reports which included inter alia health indicators for populations with access to health services in project impact areas. While it is not clear how robust the data is, at least the company has taken the first step of tracking the effectiveness of its community health program using PNG’s national health information system indicators. It reported that: HIV-infected pregnant women receiving anti-retro viral treatment reached 100% in 2011 (50% in 2009), the percentage of children under 5 who were completely immunized was 77% in 2011 (52% in 2010), and malaria incidence fell from 218 per ‘000 in 2009 to 120 per ‘000 in 2011. Fortunately the information gap in corporate reporting is partially filled by independent research, often sponsored by the resource companies. Such research is frequently disseminated through PNG’s National Research Institute and Institute of National Affairs as well as academic journals and universities. Data on corporate programs is also sometimes available from commercial sources, for example, the contractor for OTML’s community health program (AbtJTA) publishes annual progress reports and independent evaluations. Health appears to be the sector most studied by independent researchers. Their studies provide evidence that company health programs in some project areas have made a significant difference to immunization rates, nutrition, antenatal care, supervised births and the incidence of malaria and filariasis. Balancing these positives, researchers have also documented negative socio-economic impacts from mining, particularly for women, such as increased family violence, extramarital liaisons, abandonment and food insecurity due to the loss of food gardens and insufficient alternative livelihoods. See for example, the report [pdf] of the Porgera Environmental Advisory Komiti. 1. Companies should raise the bar on their reporting. It took a lot of time and effort poring over reports and seeking clarification and additional information to extract some fairly basic data and other information for this research. It is hard to understand why it should be this difficult, particularly when they all endorse the monitoring and reporting principles of the Global Reporting Initiative and have publicly committed to contributing to the development of PNG and mine-affected communities. The data that was easiest to obtain, though by no means straightforward, covers financial flows. But without information on how money is spent and who benefits, we know little about its development impact. Many companies collect some of this potentially useful information, but they may need more expertise in data collection and analysis, as well as leadership from their management executives, before publishing more and better data that is relevant for assessing their development contributions. 2. Health is an important exception. Studies in some project areas provide evidence of improved population health and better access to services as a result of corporate programs that are closely integrated with government and other service providers, including churches. This experience may provide a model for the health programs of other companies in the sector, and for other key sectors for resource companies such as transport infrastructure and education. 3. More research would be needed to throw further light on the development impact of corporate procurement (benefit distribution along the supply chain), and of compensation and royalty payments to landowners and communities (control and benefit sharing in families and communities). 4. Project communities and responsible PNG authorities would do well to identify ways to improve the accountability of the provincial development authorities and trusts that receive funds from resource companies. At the very least they should publish audited annual reports. 5. Finally, all mining and petroleum companies are required to report regularly to the Department of Environment and Conservation on the socio-economic impact of their projects. But the Department has set no guidelines for these reports, does not provide any response to them, and does not publish them. 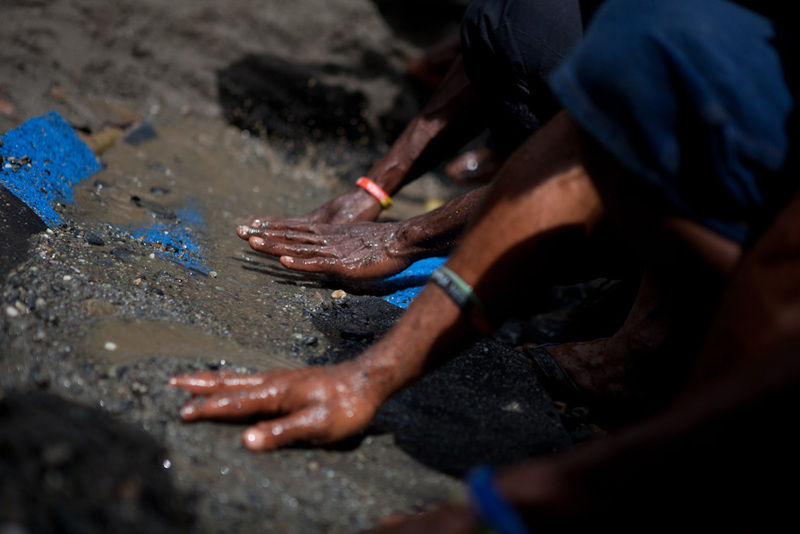 The PNG Chamber of Mines and Petroleum could make an important contribution to transparency and accountability in PNG by doing three things: introducing a standard format for members’ reports that includes clear and consistent information about payments and programs; publishing these reports; and disseminating them widely. Margaret Callan is a Visiting Fellow at the Development Policy Centre.